The July Newsletter 2015 reports mainly about the highly successful International Symposium on the Diabetic Foot (IWGDF) which was held from 20-23 May 2015 in the World Forum in the Hague, The Netherlands. There were more participants and attending countries than ever before. Preceding the ISDF the important IWGDF Guidance-Implementation Day was held on May 19th. We report also on another major achievement, the launch of the IWGDF Guidance 2015 documents on the final day of the symposium. Professor Benjamin A Lipsky was invested with the prestigious 'Karel Bakker Foot Award' and Professor Jan A Rauwerda received the first 'Diabetic Foot Medal of Honor'. The Oral and Poster presentation award winners, as well as the Audience prize winner at the ISDF are not forgotten. Read the names and titles of their presentations. Several colleagues have received awards elsewhere. The 7th International Symposium on the Diabetic Foot (ISDF) 20-23 May 2015 World Forum, The Hague, the Netherlands. 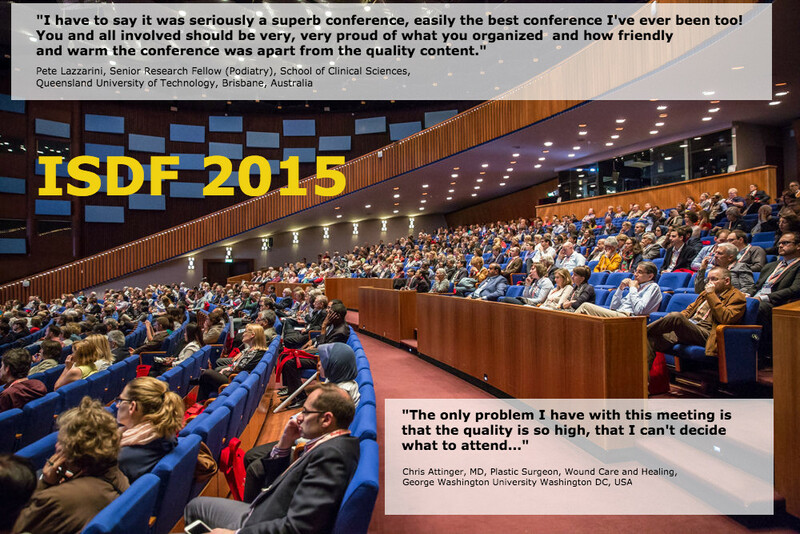 The 7th ISDF meeting from 20 till 23rd of May 2015 was an unique event because of its multidisciplinary character. There are only few meetings in the world were both health care workers and scientists from so many different backgrounds meet. The 3 ½ day program consisted therefore of different tracks that were attractive for different disciplines, with topics such as peripheral artery disease, foot surgery, wound healing, basic science, practical workshops, lower limb biomechanics, neuropathy, infection, etc, etc. The launch of the International Guidance on the prevention and management of the diabetic foot was another highlight of the Symposium. These Guidance documents are produced after 2 years of hard work by groups of experts of the International Working Group on the Diabetic Foot (IWGDF). CongressbyDesign was a perfect organizer of this very successful meeting. Bottom right picture: new technologies. The 7th International Symposium on the Diabetic Foot (ISDF) was a great success. This Symposium was by far the largest meeting held on this topic and more importantly, it truly reflected the multidisciplinary approach needed to diagnose and manage diabetic foot problems. Organizing such a meeting that is attractive for all the different disciplines involved, such as basic scientists, wound care specialists, physicians, diabetes educators, surgeons, orthototists, etc, etc, is a truly a challenge. Our Symposium was a success because of the help and input of so many people, with a faculty of more than 70 renown experts who in their excellent lectures and workshops covered for instance diverse areas such as the patients’ view, impaired hypoxia sensing, how to examine a diabetic foot ulcer, foot surgery and vascular aspects. Another striking aspect of the Symposium was the very good atmosphere and camaraderie amongst our participants, with the Symposium diner in the famous municipal museum of the Hague as highlight. I am looking forward to receive all the readers of this letter in May 2019 in the Hague at the 8th ISDF! 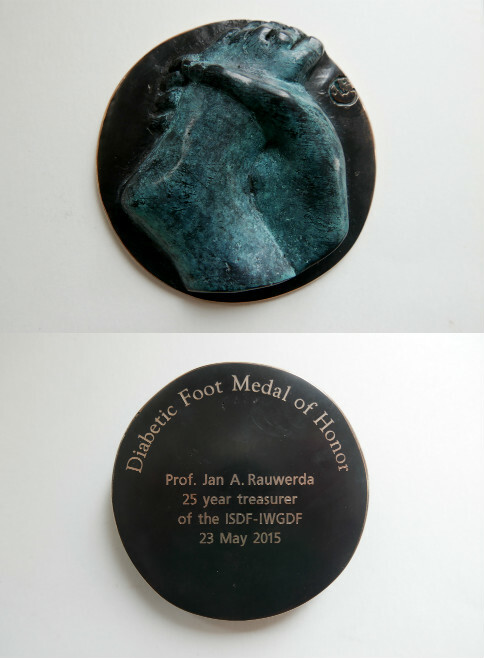 At the ISDF presidential dinner at 20 of May 2015, in the Mauritshuis museum in The Hague, Professor Jan A Rauwerda Amsterdam, The Netherlands was honored because of 25 years treasuring the ISDF / IWGDF and his tireless promotion for diabetic foot care. ISDF’s president Professor Nicolaas Schaper awarded him with the first 'Diabetic Foot Medal of Honor". 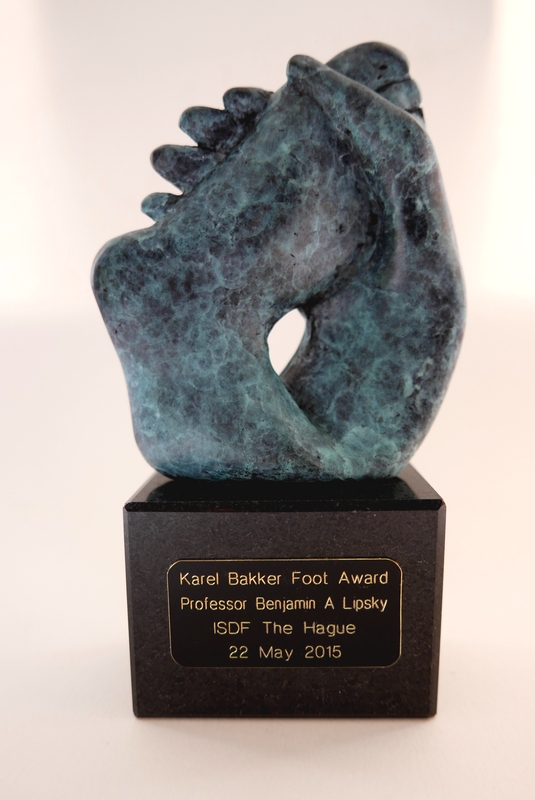 At the ISDF 2015 in the Hague, The Netherlands the 'Karel Bakker Foot Award' was presented by thepresident of the ISDF to Professor Benjamin A Lipsky, Oxford/Seattle at 22 May 2015. This most prestigious and unique 4-yearly award, to many quoted as the 'Oscar' of the diabetic foot is given to honor scientists and clinicians, who have made major contributions to our understanding, prevention and treatment of diabetic foot disease. Professor Lipsky is a leading and influential scientist, expert and teacher in the field of diabetic foot disease. His work in the area of diabetic foot infections has been pivotal in improving the diagnosis and management of this limb threatening complication of diabetes. He has published more than 220 scientific papers and he is also closely involved in the development of guidelines, both in the USA and world-wide. He was as member of the IWGDF Editorial Board and as chair of the Infection Working Group very instrumental in the development process of the IWGDF Guidance 2015 documents. This work has contributed to saving of many legs of diabetic patients all over the world. After the introduction of the new Guidance 2015 documents (www.iwgdf.org) by the chairs of the different IWGDF Working Groups, the rest and most of the day was attributed to the implementation process of the Guidance. “A Guideline is like a map showing where to go. From the 7 IWGDF/IDF regions 97 participants were present, representing 68 countries. The Implementation program started with several introductory lectures. Dr Belma Malanda, the project manager of the Policy and Program Department of the IDF, talked about: "Barriers and the opportunities of implementation programs in Health Care", to be followed by an update of the chair. After this, 4 speakers gave examples of "real life" implementation programs. They were Dr Z. Abbas from Africa, Dr Nalini Campillo for Latin America, Dr Alberto Piaggesi for Europe and Dr Shigeo Kono for the West- Pacific. The next steps were to start group discussions. The groups were divided according to their regions with 4 from Europe. What are the “gaps” or “needs” for national DF Care? What are the barriers for implementation of a national DF Program? What are the 3 top priorities/expectations towards the IWGDF organisation? What can be a common action in your region in the near future? The participants felt empowered after being introduced to the new guidance documents, and felt that the discussion during the workshops helped them to formulate the first steps for their regional and national implementation programs. Some of them had very well described action points. They also stated the need of support of IWGDF/IDF for convincing governments and for general support. The chair felt that we have to support all national representatives for the first steps of implementation, including the translation of the new practical guidance document where needed, to be followed by national meetings to disseminate, educate and communicate the principles of the new guidance document to other healthcare providers supported by their patient organisations. During the International Symposium on the Diabetic Foot, the 2015 IWGDF Guidance documents were presented. These documents have been updated every four years since 1999, each time with improvements and additions. The 2015 Guidance essentially boil down to the 77 recommendations for clinical practice, formulated as short and active sentences. However, the end up with these sentences, an intensive process has taken place in the last 18 months. Starting in November 2013 with a meeting where a representative of the World Health Organisation advised the IWGDF on evidence-based guidelines, five working groups were installed by the Editorial Board. These groups consisted of 49 specialists in the field from all over the world and covering the entire multidisciplinary diabetic foot field. All experts were ‘volunteers’, contributing to this project with their valuable knowledge and time. In these last 18 months, 15 meetings were held, and 7 systematic reviews were completed. For these systematic reviews, the authors screened almost 80.000 articles, and included 429 publications in the final analyses. Based on these systematic reviews, 5 Guidance documents were written. The last step in this approach was the formulation of clear recommendations for clinical practice to summarize the Guidance. For this, the GRADE system (Grading of Recommendations Assessment Development and Evaluation) was used. With this system, evidence-based recommendations are given, accompanied by the strength of the recommendation (i.e. how important is this) and the quality of the evidence this recommendation is based upon. The Editorial Board and each working group went through, sometimes extensive, discussions, to create the best possible Guidance documents on the topics “prevention”, “footwear and offloading”, “peripheral artery disease”, “infection” and “wound healing”. These Guidance documents were sent to over 100 international colleagues, all representing their country. The results were more comments and discussion, and again an improvement of the Guidance documents. Finally, a Summary Guidance for daily practice 2015 was written by the Editorial Board. All documents are available at now costs at www.iwgdf.org. The end-result of this intensive, challenging, interesting and rewarding process are the 2015 IWGDF Guidance documents. We now trust and expect that this Guidance is translated into local guidelines countries all over the world, to ensure implementation, and thereby leading to an improvement of prevention and management of foot problem in diabetes. 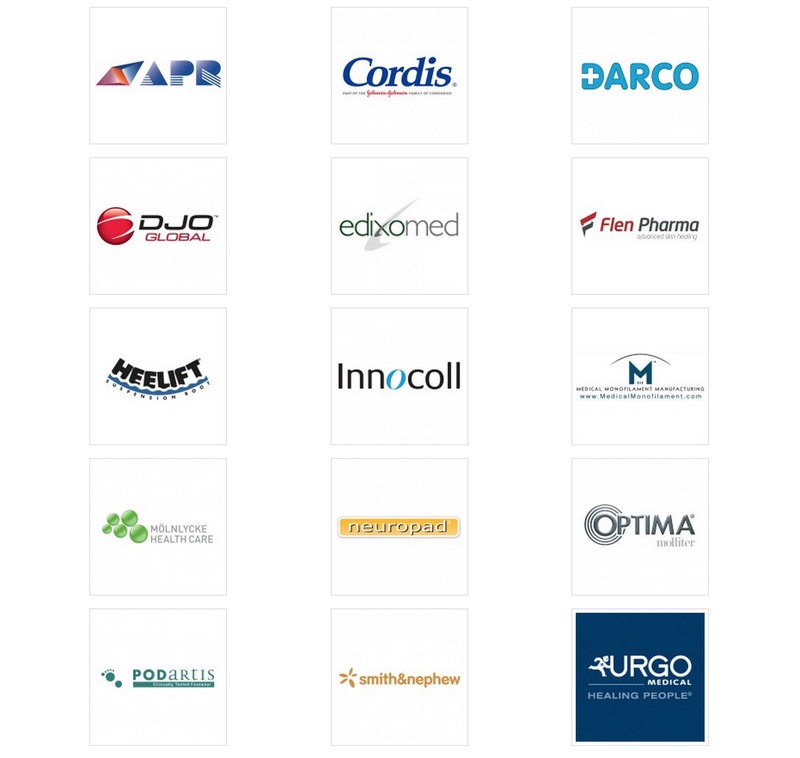 The production of the Guidance 2015 would not have been possible without the invaluable contribution of our sponsors. Grant Skrepnek, Sole searching: What happens when nearly 2 million people with diabetic foot ulcers walk into outpatients clinics? Oklahoma City, United States. The Pacific Islands feature 7 of the top 10 nations worldwide for diabetes prevalence. Foot problems in diabetes and diabetes-related amputations are also highly prevalent in these countries. Improvement of diabetic foot care is crucial to prevent these devastating consequences. Together with local clinicians, Motivation Australia and the International Society of Prosthetics and Orthotics (ISPO) Australian National Member Society are working hard in various projects to tackle this difficult task. For example, a new diabetic foot clinic has recently been set up in Samoa. More on this can be found in our previous newsletter. During the ISPO World Congress 2015, Taukori Tibiriano received the 2015 IWGDF Guidance to start with the implementation in his home country, Kiribati. Tibiriano is a physical therapist working in a rehabilitation center where they care for many patients with diabetic foot problems. Lee Brentnall (Motivation Australia) received further copies, to distribute in other countries in the Pacific. Both were very happy with the new Guidance and are looking forward to start with the implementation of relevant recommendations in the Pacific. 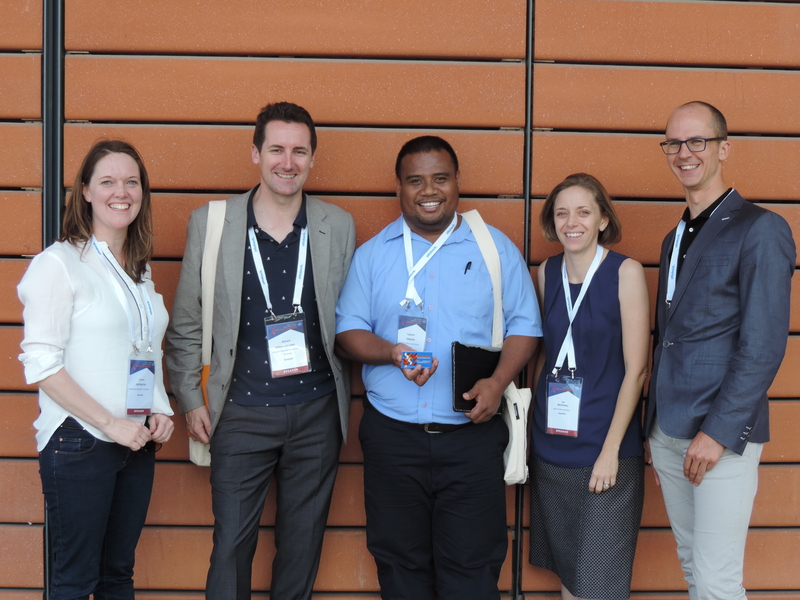 From left to right: Lauren Fortington (President of ISPO Australia), Richard Dyson-Holland (volunteer orthotist for ISPO Australia Outreach Committee), Taukori Tibiriano (physical therapist from Kiribati), Lee Brentnall (Motivation Australia) and Jaap van Netten (IWGDF Editorial Board Secretary) with the 2015 IWGDF Guidance. At the DFCon meeting in Los Angeles the 'Edward James Olmos Award' for advocacy in amputation prevention was at awarded to Professor Nicolaas C Schaper, Maastricht, the Netherlands at 20 March 2015. DFCon Co-Chairman Dr. George Andros praised Dr. Schaper’s work by saying: "Through his research and practice, Dr. Schaper has truly become one of the leading experts on lower extremity diabetic complications throughout the world. Conference Co-Chairman Dr. David Armstrong added: “There are few, if any, people that have had the sustained impact on merging practical clinical questions with superb collaborative multinational research than Dr. Schaper. It is for this reason that we owe him a great deal of gratitude and we honor him this year". Dr. Bakker served as a specialist in internal medicine, diabetology and endocrinology at the Spaarne Hospital, Heemstede, The Netherlands until his retirement in 2002. 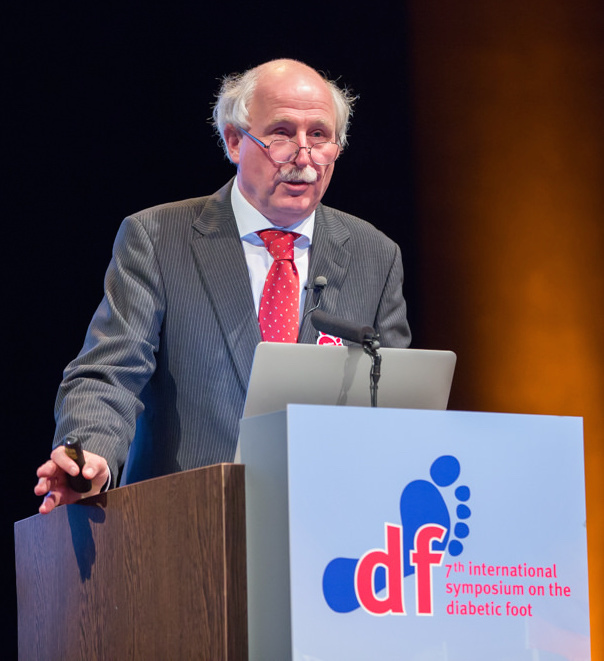 Dr. Bakker founded the first specialized Diabetic Foot Clinic in the Netherlands in 1987 and has made significant contributions to shape guidelines on the management and prevention of diabetic foot complications since 1996. In addition, he initiated multiple implementation programs throughout the world and led the year long awareness campaign of IDF's World Diabetes Day program on the Diabetic Foot in 2005. The title of Dr Bakker's lecture was '30 years of diabetic foot care, from the wilderness to the promised land'. Professor Peter Cavanagh, to many of us known as a leading figure in the diabetic foot world received at the Kennedy Space Center in Florida at 2 June 2015 the Distinguished Public Service Medal for countermeasures against bone loss during long space flights. The National Aeronautics and Space Administration – NASA – has awarded space travel medicine researcher Peter Cavanagh, University of Washington, Seattle. He was honored for 30 years of service to NASA in the development and testing of exercise countermeasures against bone loss during long space flights. Cavanagh is professor of orthopaedics and sports medicine. The Distinguished Public Service Medal is NASA’s highest form of recognition for non-government employees. It is given for service, ability or vision that has personally contributed to NASA’s advancement of United States’ interests. According to NASA, the award recognizes extraordinary achievements at a level of excellence that has made a profound or indelible impact to NASA mission success. Cavanagh was the principal investigator for a number of space flight experiments. Copyright © 2015 IWGDF, All rights reserved.